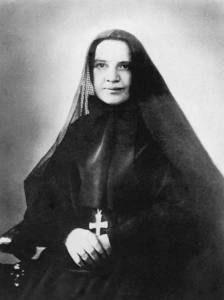 Dear to the hearts of American Catholics in many regions of the United States, Saint Frances Cabrini, foundress of the Missionary Sisters of the Sacred Heart, patroness of immigrants, was the first citizen of the United States to be canonized. Born in Lombardy, Italy, the youngest of thirteen children, she was fired with missionary zeal as a little girl, through family reading of the Annals of the Propagation of the Faith. She gave up sweets because she would also be without them in China, where she aspired to go. She earned a teacher’s certificate and applied to two Orders having missionary houses, but was rejected for reasons of health. Reluctantly, at the request of her bishop, she tried to save an orphanage and make of its staff a religious community, but after six hard years the work collapsed. And Frances, by then thirty years old, initiated her own missionary community with seven of her associates from the orphanage. Bishop Scalabrini suggested they work with Italian immigrants, especially in the United States, as the Congregation of Saint Charles which he had founded was doing; but Mother Cabrini’s heart was set on China. She asked counsel of Pope Leo XIII. Go not to the East, he told her, but to the West. Explaining why she did not accompany some Sisters on a boat excursion she wrote, I admit my weakness, I am afraid of the sea. And if there is no very holy motive in view, I have no courage to go where I fear danger, unless sent by obedience. For then, of course, one’s movements are blessed by God. Mother Cabrini died at sixty-seven, suddenly and alone in one of her Chicago hospitals, while preparing Christmas presents for 500 children. Source: Lives of the Saints: Daily Readings, by Augustine Kalberer, O.S.B. (Franciscan Herald Press: Chicago, 1975). For more information, please refer to Mother Cabrini Shrine.